The relation is in fact a simple one-to-many relation. 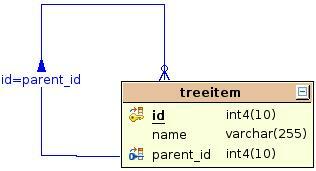 @OneToMany(mappedBy="parent", cascade = CascadeType.ALL) specifies that the relation is managed by the parent property. @ManyToOne specifies the relation @JoinColumn(name="parent_id") specifies which column is the foreign key column to the TreeItem primary key. What is interesting in the mapping is that I have set a cascade. when the parent is saved. Warning: You can create recursive relations with bag or set notation. If you want to use other like an indexed list, you must create some “dirty" work arounds. Have a look in the Hibernate reference for more information.